"Any guesses to what I am praying for?" -Blame it on the interesting TV Commercials "God Own Country".For nomads like me,places which are still not marked on my list,gets added up. 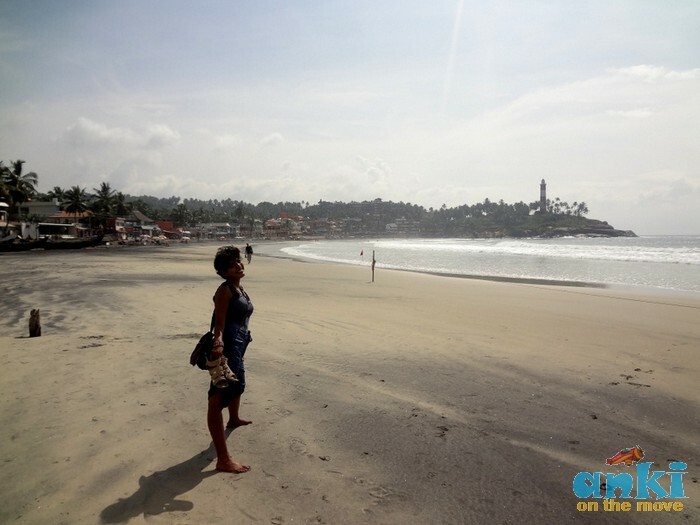 Kovalam was one such "just out of TVC" wish. 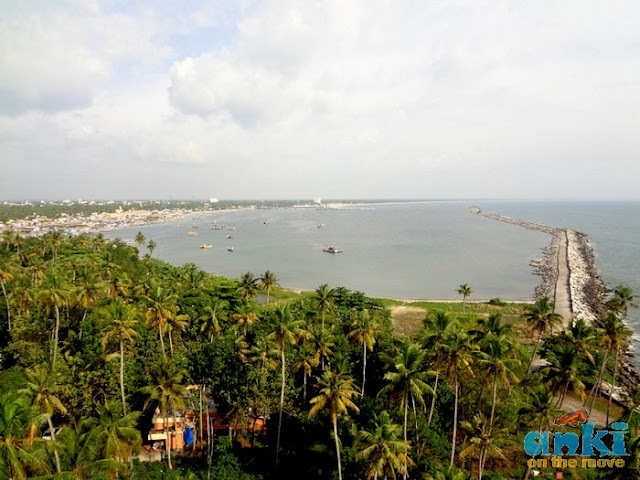 -Last Year my trip to Allepey was wonderful.Imagine boating in the backwaters,and eating fried fish just out of the lakes and rivers.This time,I thought lets discover Kovalam. -Kovalam also is a great surfboarding destinations as the sea has great waves. Sometimes pictures are deceptive,Kovalam I wouldn't say is that worth,although the pictures come really nice. Even though I usually do not project a place in a bad light,it is important to be true when writing a blog.Imagine I write about a place and that turns out to be completely opposite in reality. -Kovalam is a little hyped place,I would rather prefer Varkala in Kerala if beaches are on my mind and the reasons are listed below on why. -Not many are aware of,but Allepey are best for backwaters,Varkala for beaches and Munnar for hills. We started off from chennai for our journey to Trivandrum.It takes 15 hours from Chennai to reach Trivandrum.The Kovalam beach is 11kms from Trivandrum. peaceful.Thank god we still don't have the fast running jet trains,we can enjoy every terrain every landscape in a slow motion "chuk chuk gadi". 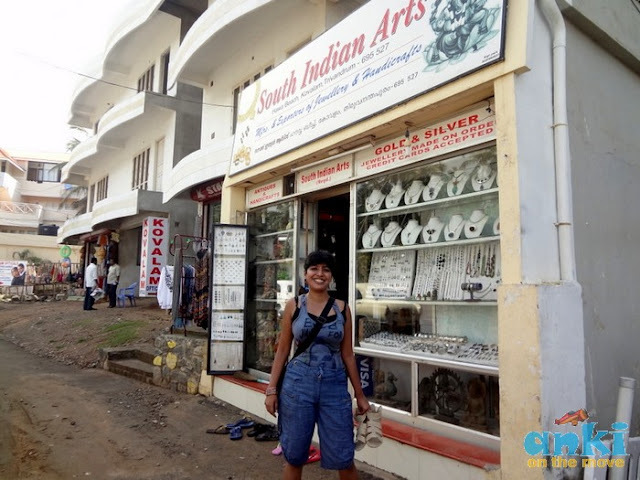 I usually use 100% of the time I have in hand to explore places,this one was no different.With a day to tour around which I had reserved to know and explore Kovalam;when the train reached Trivandrum,my mind changed and I was like,why not Trivandrum to begin with.With the little time I had,I explored this beautiful temple,can't say magnificent but yes,the feeling of standing in front of the richest temple was different.Call it "The uncle scrooge moment". As casually dressed in my jeans,the Pandit wrapped a longer than a Lungi shorter than a Sari garment around me,and I've never been this traditional my whole life,but as they say,every place in India brings surprises.The huge eternal resting pose in gold of the padmanabha swamy was grand. - Sree Padmanabhaswamy Temple in Trivandrum is one of the 108 Divya Desams of Lord Vishnu situated at Trivandrum, Kerala. - The wealth of Lord Padmanabhaswamy, kept unbelievably safe, so far counted is estimated at Rs 1 lakh crore. 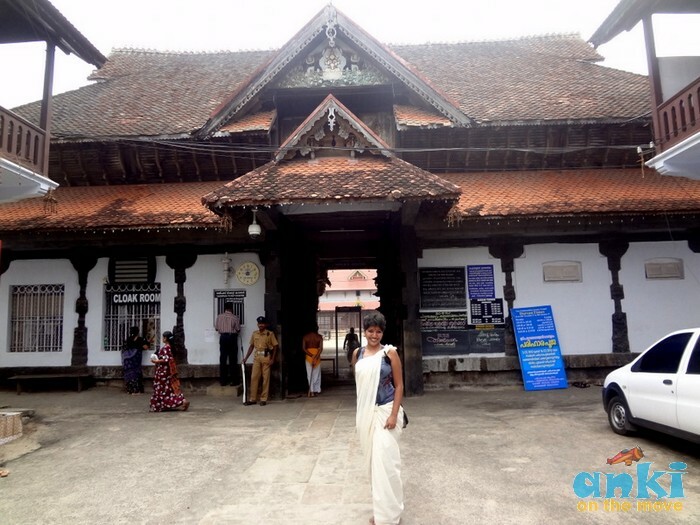 -Indian temples are usually welcoming to guests, not so in this part of Kerala. Only Hindus in traditional garments are allowed in. A beautiful white six yard wrapped around me in a jiffy,was very traditional indeed. Inside the temple only white lungi (mundu) is allowed for men.Even shirt are not allowed in for men. -Even after much hullabo after the declarations if Sree Padmanabhaswamy Temple,Trivandrum being the Richest temples of the world, the entry remains as simpler and easy as always. Though we find lot of security on the doors,the entrance was simple and it made me think "was it really the richest temple I was going into"
-Darshan to Shree Padmanabhaswamy Temple,Trivandrum was chaotic.Loads and lots of people pouring in,trying to get a single glimpse of shree padmanabha swamy.The management seemed confused on how to control the crowd. -The eternal resting pose of Sree Padmanabha Swamy with his left hand sheltering a little shivalinga underneath, can be viewed from three different doors. I was lucky enough to be escorted by the local Pandit so I did avoid the queue,and covered the three temples in the first place. -- Sree Padmanabhaswamy Temple,Trivandrum temple complex that also houses golden lizard,which is worshiped as well.The golden lizard is placed upside down on the ceiling of the wall,we had to climb stairs to seek his blessings. -Camera inside at Sree Padmanabhaswamy Temple,Trivandrum,not allowed. Advantage:Of course,the richest temple in India.What more to say? Disadvantage:Non- hindus are not welcome.Gets chaotic at darshan time. "Ringa ringa roses,pocket full of poses",Gone are the picnic days.The veli tourist village in trivandrum will remind you of your childhood,when you used to go out with your parents,relax stroll in a garden.Of course,children these days prefer playing farmville on FB more,how things have changed. I have this hate-love relationship with the social networking sites.I love it when it comes to making new friends,contacts,connecting with friends,checking out their pics.But hate it,as I used to do something more productive before and never used to have virtual friends.The ones who ping you,like you but never call you. 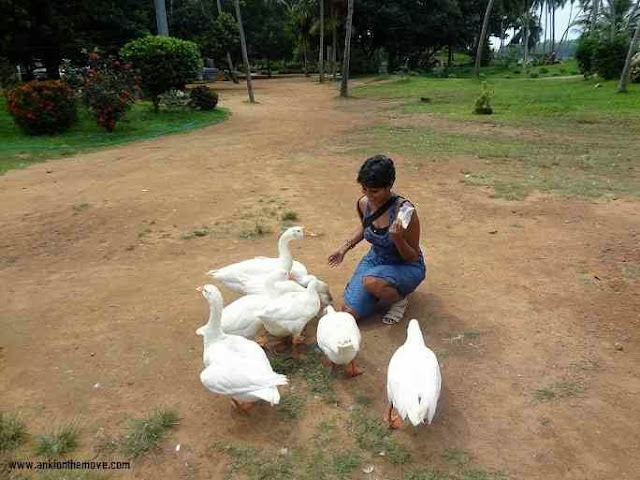 Back to picnic,veli tourist village is 8 kms from Trivandrum ,and is a popular picnic spot.Not the ones which make you say wow,but yes,the sculptures and the lake is beautiful.And the best part is,I got to feed the birds there,each one curious to know whats in for them. -The Veli Tourist Village (8 km from Thiruvananthapuram city) is sandwiched between the Veli Lagoon and the Arabian Sea. -The lagoon here is separated from the sea by a narrow sand bar. Facilities at the village include water sports in the lagoon and 18 acre waterfront park with a floating bridge that connects the village to the beach. 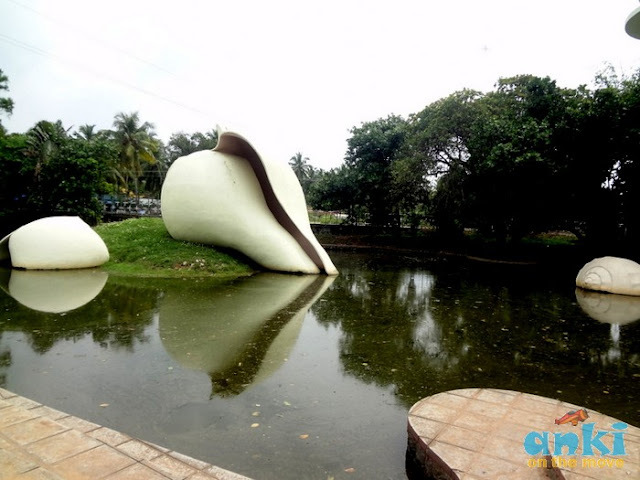 - Besides water sports, am 18 acre waterfront park with floating bridge connects the village to the Shankhumukham beach and also there is a children’s park around the floating bridge. Disadvantage:None,but don't expect miracles.The village is a park an ideal picnic spot.Nothing more. 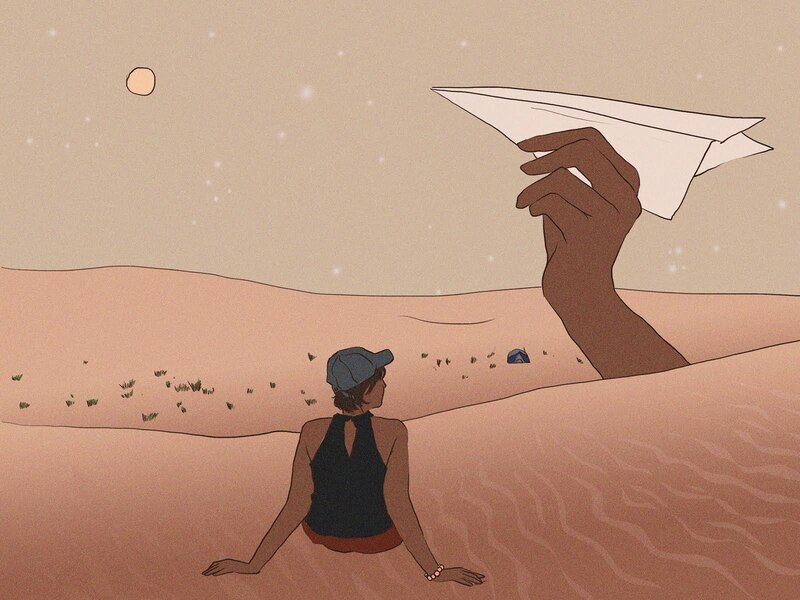 Advantage:A relaxing gateway for a day,or for a day out with friends. Shanghumugham Beach Trivandrum is notorious for its menacing, fear-inducing tides.The place where the boards invite you with a warning on not to swim.The first thing you notice is the big sculpture of a mermaid.A giant huge 35 m long sculpture at the entrance is a major attraction.We spent 5 minutes at the beach,we cant swim,we cant do much at the beach.Just a few clicks here and there and we were ready to go kovalam. 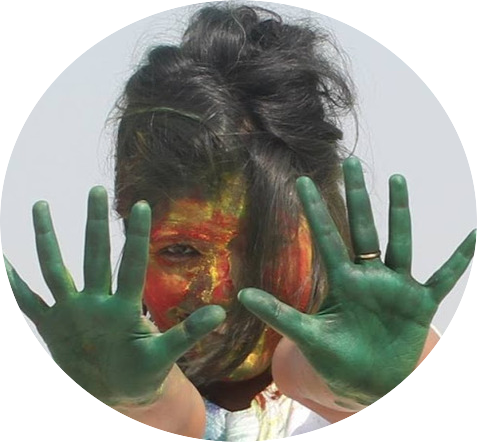 -If you go further from Shanghumugham you can reach famous Veli tourist village. 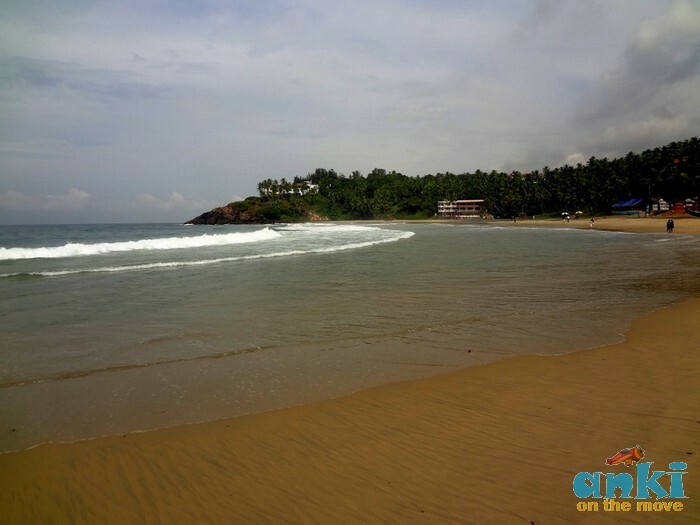 -Shangumugham beach is a perfect place to watch sunset and sunrise. Advantage:The giant sculpture of mermaid. Disadvantage:Not much to do here. Kovalam isn't one of my favorite beaches. As for me,sea is about diving in and not fishing out! Kovalam beaches are pristine beautiful,but deep,the shore makes waves in an arc,and you know this place is not for that long swim.The kind of where life guards are more vigilant than you,yes,the moment I entered sea,they put a tight rope across and I was told to move away as waves here are unpredictable.Maybe It wasn't a day for a swim. -Kovalam has four beaches Samudra Beach, Ashoka Beach, Eves Beach and Lighthouse beach all within short distance of each other, provide visitors with their fill of sun, sea and sand. 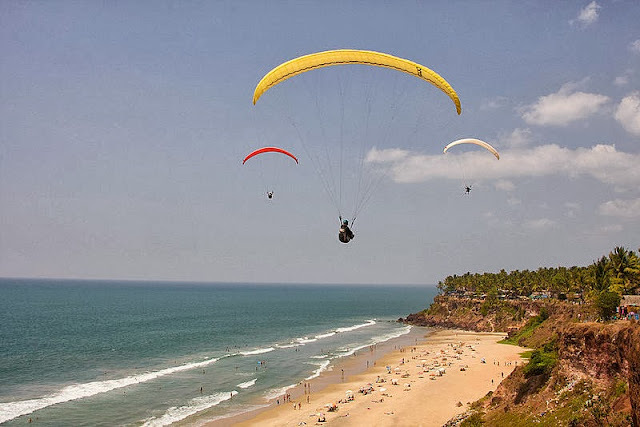 -Kovalam not only attracts tourists with scenic beach beauty, but also because of Cruising, Ayurveda therapies, Shopping, Snorkeling lending the exotic locale a different identity. 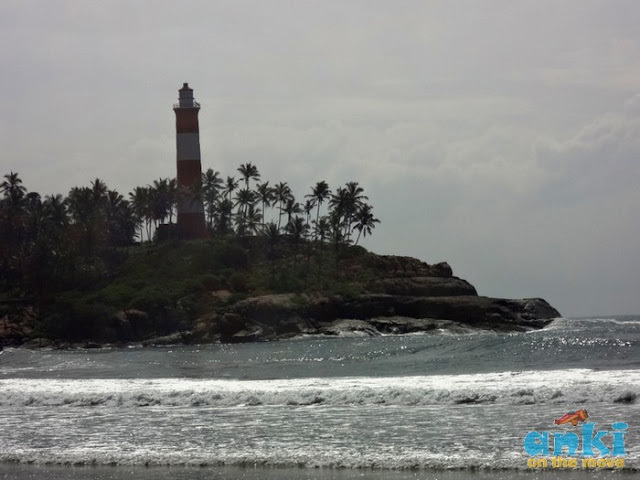 -The view from the Kovalam lighthouse was stunning,with one side covered with tall coconut trees and the other side the harbor and the sea. -The sea at the fishing harbor is beautiful,you need prior permission to enter the harbor but its worth the visit.Specially when from the lighthouse you get to see the vast road which cuts the sea across,maintained clean. Advantage of Kovalam: Its a nice gateway,though I think a bit over rated. Disadvantage of Kovalam:None.I wish the sea was more calm. 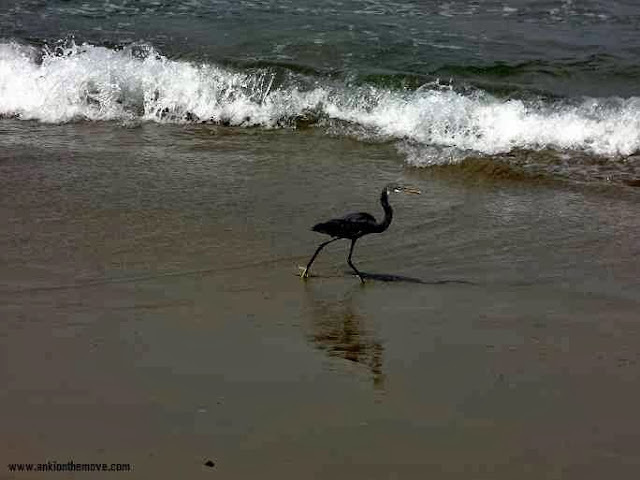 Snorkeling has recently started at Eve's Beach Kovalam. Though I doubt about the visibility here,as the water is not crystal clean and plain blue,how much of coral reefs can you see here is a question.But then again,unless you try it yourself you would never know. Snorkeling involves swimming through a body of water while equipped with a diving mask with a shaped tube called snorkel. 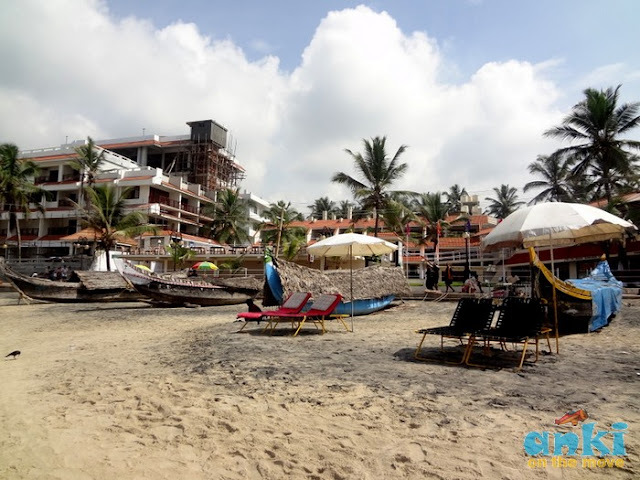 There are several guides for snorkeling at kovalam, they provide you with breathing apparatus and clear goggles but the sport is yet to catch up. The only feasible diving spots happen to be near the rocky parts of the coast where colorful fishes, mussels and plants can be observed. Since fishermen practice shore seine fishing at Lighthouse Beach, the only spots available are Edakkal rocks and a strip near Leela hotel. 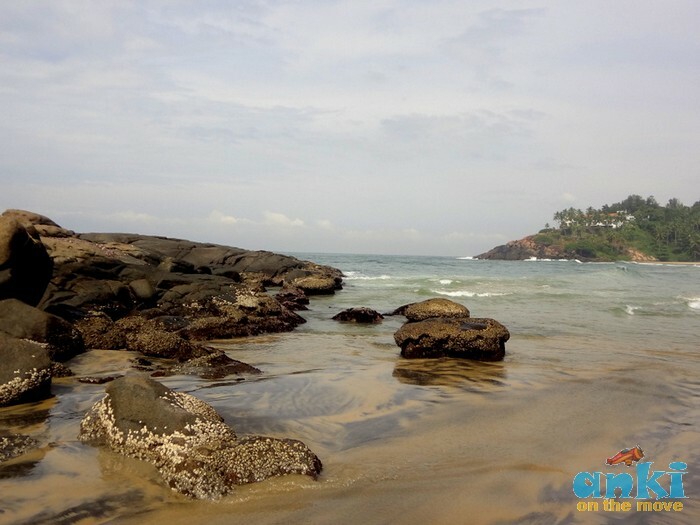 The best time to go snorkeling at Kovalam is December to March when the sea is calm. Surfer from all over the country flocked down to Kovalam to challenge the waves and the members of the Kovalam Surfclub.Kovalam is a great surfboarding destination. Karan Veer Singh,suggests "Check the private beaches ....light house...area near masjit"
Vishnu Guru suggests "I have been to kovalam long ago...gues Leela Kempinski has a resort thr"
It is a good coincidence that you couched a lot about Sreepathmanabha Swami Temple in Kerala while this temple became the most sensational news on all medias few months ago thanks to the treasure of hundred crore found in the underground chambers of this temple. 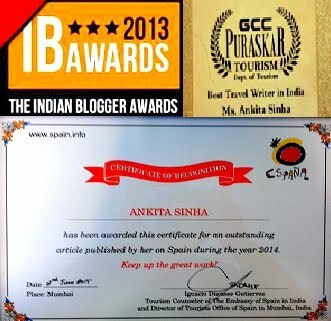 I love your writing about Kerala. 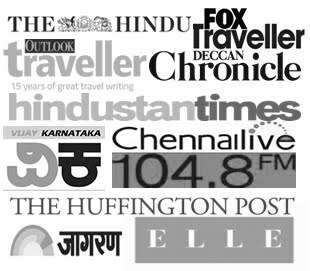 Great that you liked it..Since you are from kerala,would you like to guest post,about where to go in kerala,what to eat in kerala,which places are recommeded...to help the travellers who go there.Let me know. I have been to Allepey,Munnar and other places,munnar I have a blog,but for other places,since I have been to long back don't have many photos and videos,so can't create an interesting post out of it.I dun blog just for the sake of it,so if I visit them again will do my part of blogging. 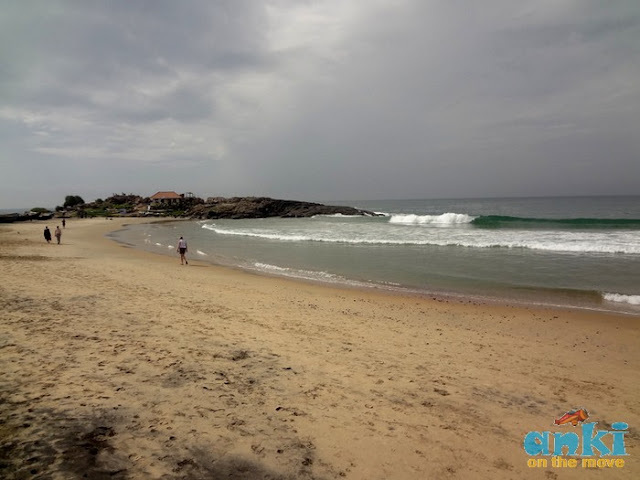 I have been to Kovalam recently and I enjoyed a lot may be because I haven't been to others places in Kerala..But the Sea,Yes in Kovalam they are a bit rough on waves..